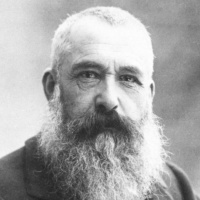 Oscar-Claude Monet (November 14, 1840, Paris, France, to December 5, 1926, Giverny, France) was a French painter and one of the founders of Impressionism, a term that was at first derisive but which came to describe a revolutionary style of painting that paved the way for all forms of modern art. 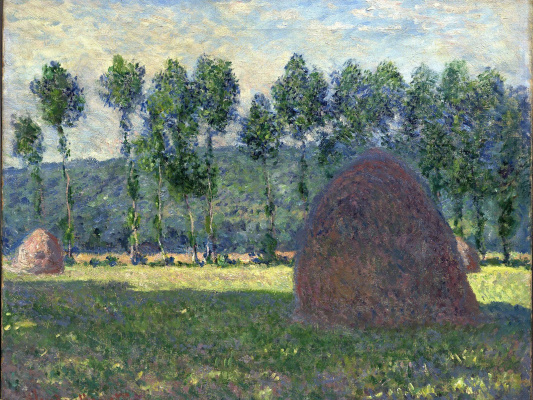 The main subject of Monet’s paintings was light and air, and his main principle was capturing the fleeting image of nature in the open air. He invented and perfected the method of painting a series of landscapes with the same story but at different times of day, weather conditions, and seasons. One series may consist of several dozen paintings. 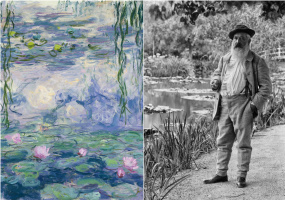 In the last 25 years of his life, Monet painted the flowers, Japanese bridge, water lilies and ponds in his garden and created the unique large-scale murals donated to the Musée de l’Orangerie, which were the precursors to modern art. Claude Monet was born in Paris, but spent his childhood in Le Havre, a sunny and noisy port city in which the Seine flows into the sea. He had no desire to study and no tolerance for the restrictions imposed upon him by his college and family. Fifteen-year-old Oscar, as he was called then, quickly found something he loved to do: draw caricatures of the people of Le Havre for 20 francs a piece (for comparison, 15 to 20 years later, Monet would be happy to sell his works for 50 francs sometimes). 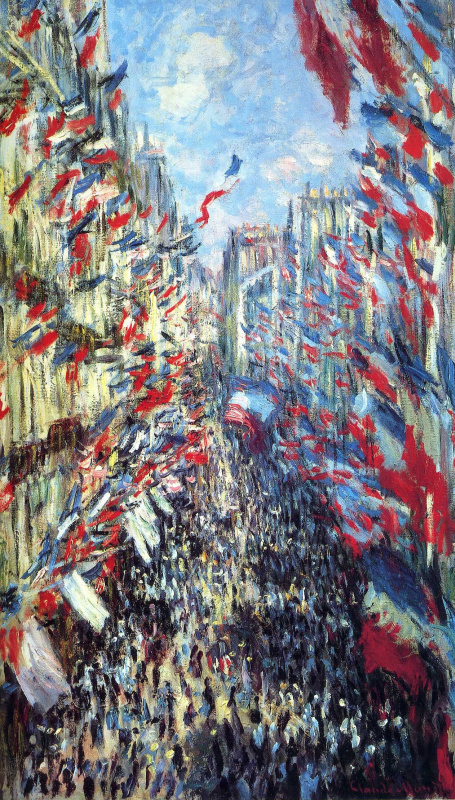 He was inundated with work and Monet quickly became a local celebrity. His caricatures hung in the windows of the only art shop in the city alongside the landscapes of artist Eugene Boudin, who first convinced Monet to paint in the plein air style (after half a year of persuasion and arguments) and taught him to see and appreciate the world around him. 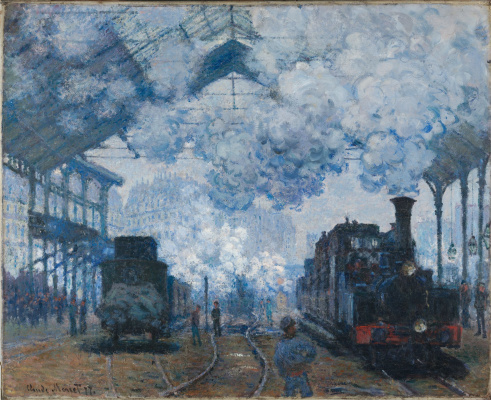 While living in Paris, Monet regularly wrote to Buden about all his discoveries and adventures, feeling a special connection with his teacher. 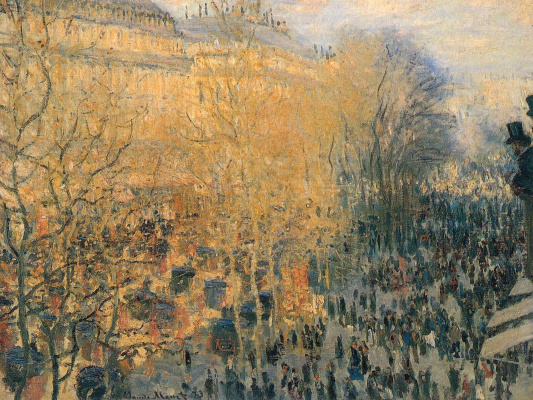 Nineteen-year-old Monet left for Paris using the money he earned by drawing cartoons. Out from under his father’s wings, he considered himself free to make his own decisions, such as not enrolling in the school of fine arts, instead going to the independent academy of Suisse, and ending almost every day debating about art in the Tavern of the Martyrs. At the age of 20, Claude was drafted into the army after drawing a low number in the draft lottery. 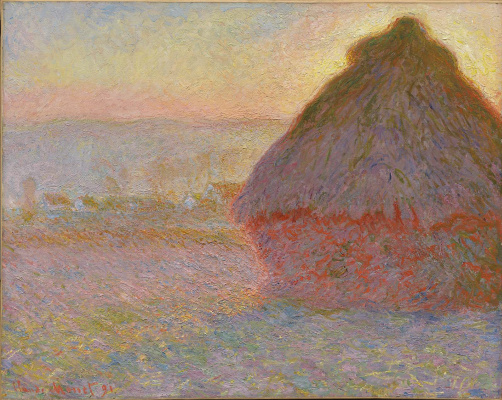 His service in Algeria was short-lived and ended in a serious illness, but Monet recalled it as a time of special light and color. Camille or The Woman in the Green Dress (1866, Kunsthalle, Bremen) was an early realist painting by Monet. It shows Camille Doncieux, the woman who would be his first wife, in a green striped dress, turning or walking away from the viewer, and is life-sized: all in all, an unusual painting for its time. He had planned on making it part of a larger piece but feared it would take too long. It sold for 800 francs, a good price for a relatively unknown painter, and, based on its quality, he was commissioned to paint Portrait of Madame Gaudibert (1868, Musée d’Orsay, Paris). Monet painted Bain à la Grenouillère (1869, Metropolitan Museum of Art, New York) at the famous la Grenouillère resort, where he went with Renoir to paint scenes of people at rest. 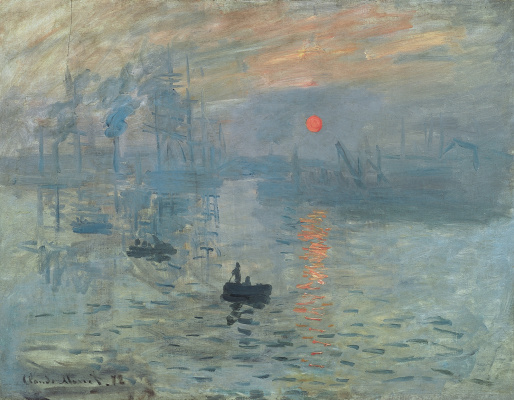 Impression, Sunrise (1872, Musée Marmottan Monet, Paris) is the work that is credited as giving a name to an entire style of painting. Now one of his most appreciated works, this view of the port of Le Havre, his hometown, enraged the stuffy, conservative art critics, who mockingly labeled the atmospheric hazy genre Impressionism. 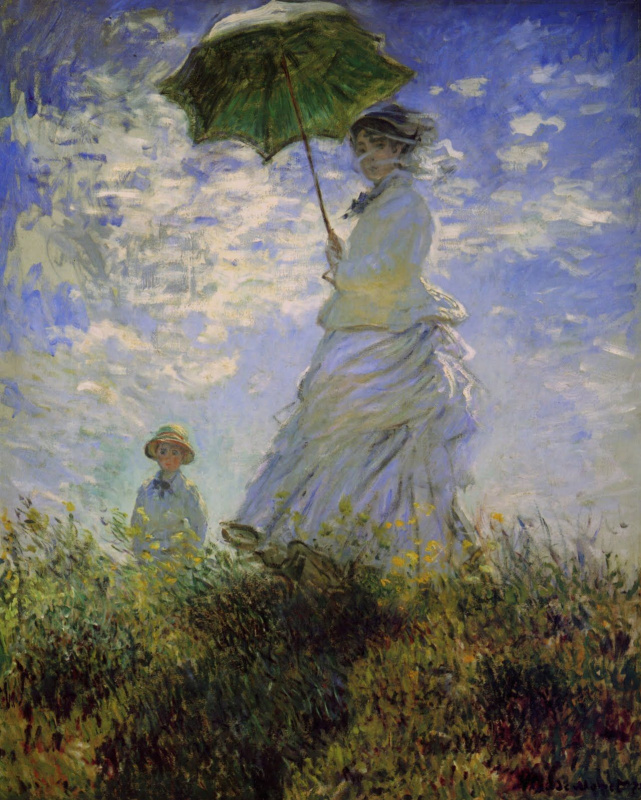 Woman with a Parasol (1875, National Gallery of Art, Washington DC) shows Camille again, walking with their son Jean on a breezy summer day, and was shown at the gallery of Paul Durand-Ruel as part of the second Impressionist exhibition. When Monet rented a house in Giverny in 1883 he became an avid gardener and started painting the Water Lilies series, about 250 oil paintings in all. 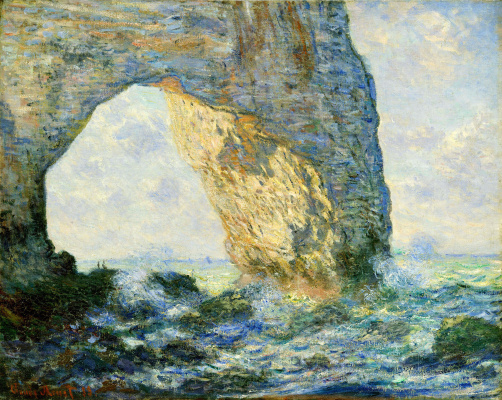 Unlike most impressionist works, many of these were close ups of the brilliant surface of the water, immersing the viewer with no horizon to be seen. Seventeen of them feature the Japanese footbridge he had installed in his yard. He wanted his work to surround and envelope the viewer in an oval room, as can be found today at Musée de l’Orangerie. 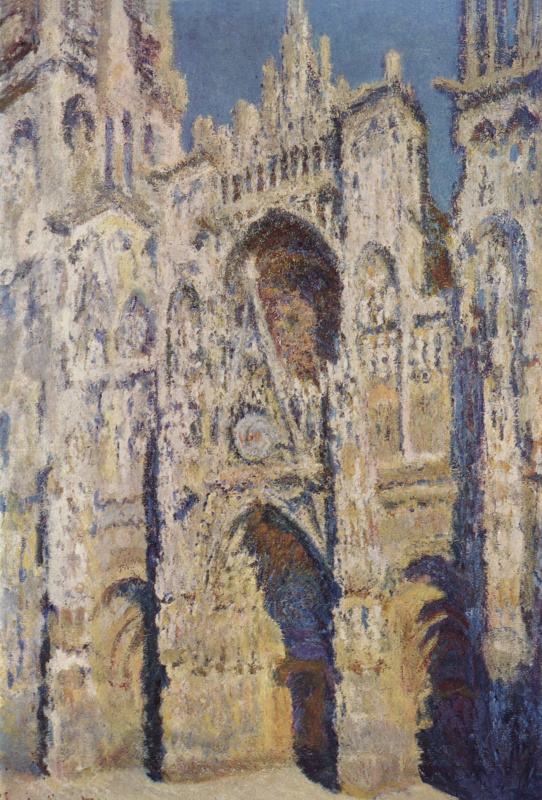 Starting in 1899, Monet started staying in London where he painted his Houses of Parliament series. He would continue working on the pieces in France, using photographs as references. All the paintings are as seen from his window at St Thomas' Hospital on the Thames, differing only by conditions of weather and time of day. In 1923 Monet had two surgeries to remove cataracts, which severely altered his vision and changed the way he saw colors, causing him to add more blue tones to some of his waterlilies. He lived to the age of 86, dying on December 5, 1920, of lung cancer, and was buried in Giverny in a modest funeral.